Working professionals who want to build knowledge quickly in a specific area to refresh or supplement their expertise can now apply to take graduate-level courses at NYU Stern through new non-degree Advanced Professional Certificate (APC) programs. Initially the School will offer three different program tracks: finance, marketing and general business. Throughout the years, working professionals, including those who already have an MBA, have consistently asked for opportunities to take graduate-level courses at Stern. The APC programs meet this need. Qualified candidates may now apply for admission to one of the three tracks and take 15 credits, or five courses, on a part-time basis in MBA classes where there is capacity. Enrolled students will have up to two years to complete their certificate. All three certificates are registered with the New York State Education Department. To assess the academic ability and potential of APC students, who will take classes alongside Stern’s MBA students, Stern requires candidates to apply for admission. As part of the admissions process, candidates must have two years of work experience and submit either a GMAT or GRE score, or proof of an MBA degree. Candidates may apply to start courses in the Fall or Spring semester. The first enrolled APC students will begin coursework in Fall 2015. APC students can take classes in the evenings or on Saturdays in Manhattan, or in the evenings in Westchester, with students in Stern’s Langone Part-time MBA program. Students may take up to nine credits per term, for a total of 15 credits, priced at the same tuition per credit rate as Stern’s Langone courses. Enrolled APC students without an MBA may choose to apply to Stern’s Langone Part-time MBA program while pursuing their certificate. If admitted, these students can apply their APC credits towards the Langone Part-time MBA so long as they do so prior to receiving their APC certificate. Visit NYU Stern’s website to learn more about all three APC programs. 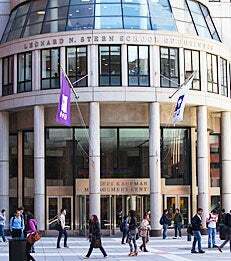 Founded in 1900 and located in the heart of Greenwich Village, New York University Stern School of Business is one of the world’s premier institutions of management education. With its more than 300 faculty and three Nobel Prize winners, NYU Stern offers a broad portfolio of academic programs at the graduate and undergraduate levels that use New York City and global hubs around the world as classroom environments for learning. Visit www.stern.nyu.edu and follow us on Twitter @NYUStern.